Students who attended my intensive, 2-day defensive combat handgun seminar, "Surviving Under Fire! ", paid as much as $450 plus airfare, hotel, and meals to attend my LIVE training event but if you are among the first 100 people to act (via this special limited time offer) you won't have to pay anywhere near that. In fact, these DVD's regularly sell for $197 for the set, but you can get instant access to the information for one low payment of only $97! ...they're going to get you killed! That's why I put together training courses that DO have the elements that you need to not only deal with, but to survive in real-world, life-or-death, self-defense situations where either you, your assailant, or both of you are armed with a handgun. And, now, whether you've ever attended one of my live training events or not, you can get the same lessons that I teach in my LIVEDefensive Combat Handgun Seminars on this limited edition 3-DVD set. Understanding the "4 Pillars of Handgun Mastery." You'll learn when and why to use a particular stance or firing position. One of the most valuable lessons learned by many of my students is that self-defense with a firearm involves MUCH MORE THAN JUST SHOOTING! What you need to know for taking a firearm away from a dangerous attacker. What do you do when you're unarmed (or at least can't get to your own firearm in time) against a killer? How to hold onto your own weapon when a crazy, intent, or animalistic attacker is trying to take it away from you. Techniques for dealing with multiple armed assailants where one of them is attempting to take your weapon or prevent you from engaging their partner with your firearm. Now You Can Have The Same Skills & Knowledge! Get your set of these powerful DVDs today and you won't pay the $450 plus course fee. You won't pay $400, $350, or even $250 either. The cost of each DVD is $67 when sold separately. That's a total of $201. But you won't pay that either. 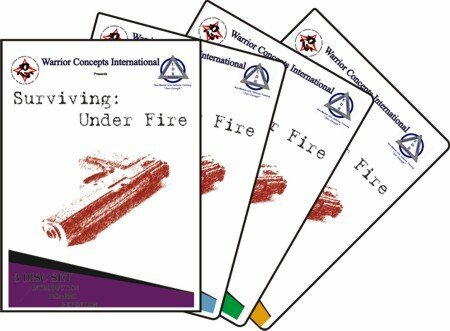 I've decided to offer the complete "Surviving Under Fire" complete set in this special, new-release promotional offer, for 79% off the regular course price. That's a savings of $353.00! Order Surviving Under Fire right now for just $97 and I'll include the shipping and handling for FREE! But, I can't hold this price forever. So, this special, introductory, promotional offer, is only available to the first 100 47 people who visit this page and take action. After that, the cost of this set goes back up to the regular pricing of $197.00 plus shipping and handling. This special 3 DVD set is a must-have for any serious student of self-defense in Today's world. And, as a part of this special offer, it's yours for only $97.00 for the complete set. I want the entire 3 DVD set and save over $353.00! That's a 79% savings off the regular price of attending this intensive course! I understand that myBuy Surviving Under Fire dvd video training set will be shipped to me as soon as I submit my order.